Announcing the Prairie Developer Conference 2010! I am VERY thrilled and excited to announce a new Canadian software development conference scheduled for 2010: the Prairie Developer Conference! I’ll be announcing registration pricing later this month, but I wanted to announce that the call for presenters is open! If you’re interested in speaking at the conference, visit the website and download the presenter request form which has all the details about what’s covered for presenters and how to submit your abstracts. One thing we’re looking for is a good mix of presentation styles: lecture, dojo, whiteboard, and panel sessions are all encouraged. If you’re interested in being a sponsor for the event, please visit the website and download the sponsor information form and email me with any questions that you may have (there’s an email button on the conference page). Finally, if you want to keep up with announcements around the conference you can follow us on Facebook or on Twitter! Regina is going to be the place to be this June, so make plans today to join us! 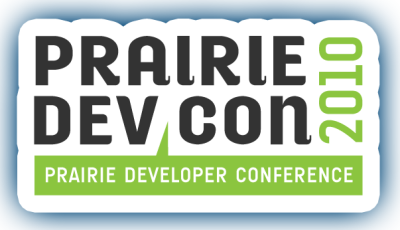 # re: Announcing the Prairie Developer Conference 2010!